Murray Suderman is an accomplished, client-focused lawyer practising in general civil litigation, insurance law, and injury litigation. Murray is committed to delivering excellent results during negotiations and in the courtroom. Murray joined Pacific Law Group in early 2018. 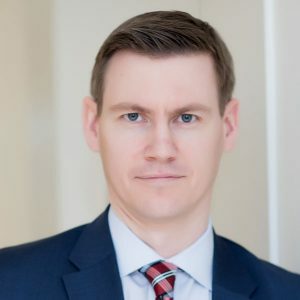 After starting his legal career in British Columbia, Murray worked with a major law firm in Alberta and has recently returned to continue his practice in the Lower Mainland. He comes to the firm with 15 years of experience in insurance, injury and construction litigation. Murray has acted for provincial, national, and international insurers in a wide variety of litigated disputes, including complex injury, major property, and professional liability claims. He has conducted numerous trials, mediations, and arbitrations in the courts of British Columbia and Alberta. Murray prides himself in approaching legal complexities in a practical, results-oriented manner. Known as professional, efficient, and tenacious, Murray has established himself as a lawyer with integrity and sound judgment. This approach has served Murray and his clients well in advancing their interests and achieving results. Outside the practice of law, Murray enjoys spending time with his wife and two sons. He can often be found at the rink or at the baseball diamond playing, coaching or cheering from the stands.